Right away this album is hard hitting and just plain epic in its scale and layers of instumentation and vocals. This is a knock out album. 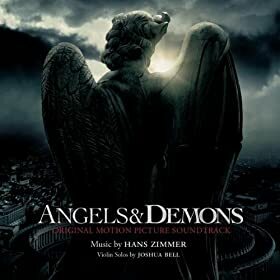 The title Angels and Demons couldn’t be more appropriate due to the use of angelic sounding vocals and choir and the darkness that is constantly cropping up. Combine that with the – I’m going to have to use the work epic again – epic feel of it. It is like a struggle between angels and demons coming out of my speakers. “I60 BPM” could easily be the fight music for a BBG (Big bad guy) or “final boss”. “God Particle”, “Air”, and “Fire” are amazing, but have too many ups and downs for me- though audio splitting software is out there on the web. “Black Smoke” is another action/battle track, however it quiets down a little more than halfway through. “Science and Religion” starts quiet and gets a little louder, but doesn’t get overly dramatic or radically shift themes, so it could be very useful for those quieter moments, when you want something a little more than silence, but not too much more. “Immolation” has me looking over my shoulders because there is definately something lurking in the shadows and by the hints of whats in the air it is not something mortal. A great suspense track. “Election by Adoration” is a quieter somber piece with a violin solo. Has a PC just died or has the party made some irreversible mistake and now they are sitting around the inn/campfire whatever and they are lost for words, but have to talk to keep from losing it? Play this. “503” has another breathtaking violin solo. It slowly builds up in the fashion of the last track of a dramatic movie, a finale piece.